Personalized Sunfire Monogram Address Plaque - - made in USA. 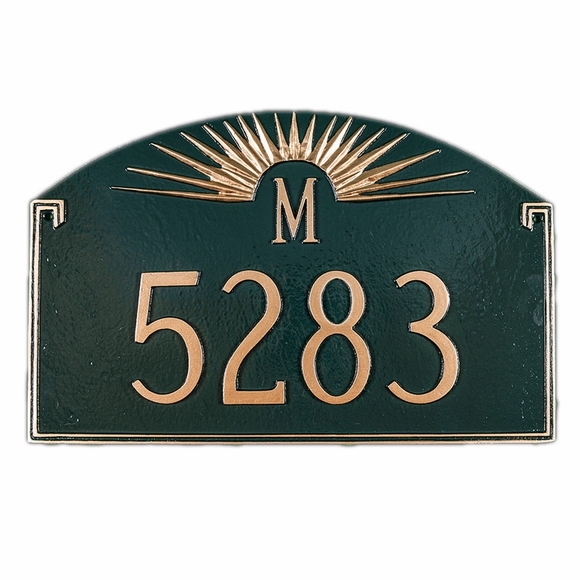 Arched-top address sign features bold sunfire rays at the top and a 2" monogram letter above the house number. Line 2 (house number) holds a maximum of five 4" characters. A thin double-line border accents the sides and bottom edge. Available with or without two optional lawn stakes. Custom made with your personalization and color scheme selection. Available in these colors: antique copper copper, aged bronze gold, black copper, black gold, brick red gold, brick red silver, black silver, black white, chocolate gold, chocolate silver, gray silver, gray white, hunter green gold, hunter green silver, navy gold, navy silver, sky blue gold, sky blue silver, sand gold, swedish iron black, swedish iron silver, sand silver, taupe white, white black, white gold, and white silver. Arch shape aluminum sign. Characters and sunburst are part of the sign, not added on. Made in the USA.